Health ministry data says 74% of specialist doctor positions in rural areas lying vacant, doctors blame poor infrastructure and pay. 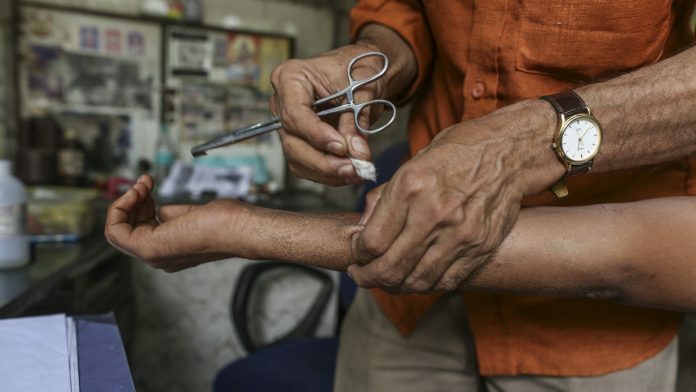 New Delhi: Smaller public healthcare centres in the country’s remotest rural areas are grappling with an acute shortage of specialist doctors even as the Central government is busy strengthening its mega healthcare scheme, Ayushman Bharat. So dire is the situation, that according to the Rural Health Statistics 2018, 74 per cent of all sanctioned specialist doctor positions is lying vacant in community health centres (CHCs) across the country. The specialists include surgeons, gynaecologists, physicians and paediatricians. As per the report, put out by the Ministry of Health and Family Welfare, of the 13,635 sanctioned specialist positions in the over 5,600 CHCs in India, 10,051 posts are vacant. Some states such as Mizoram have no specialist doctors in rural areas — all 33 sanctioned specialist positions in the state are lying vacant. The situation is no better in the bigger states as well. In Chhattisgarh, of the 620 sanctioned positions, 559 (90 per cent) are vacant. In Madhya Pradesh, of the 1,336 sanctioned positions, 988 (74 per cent) have not been filled. In Rajasthan and Telangana, over 65 per cent of the positions have not been filled. A senior official at the Health Ministry, who did not want to be named, blamed doctors for the situation. Under the government’s National Rural Health Mission (NRHM), healthcare in Indian villages is divided into a three-tiered structure of sub-centres, primary health centres (PHCs) and the community health centres. While the sub-centres have nurses and midwives, the PHCs have general doctors for primary care. The CHCs are at the apex of this structure. They are 30-bed hospitals that are meant to offer specialist consultation and act as referral centres for district hospitals. They are established and maintained by the state governments. The CHCs are to provide modern healthcare services such as X-ray machines, pathological laboratories, operation theatres and labour rooms. They are meant to not only cater to the rural population but also ease overcrowding in district hospitals. “The availability of specialists has been a concern for many years. If we are to compare the situation at the start of the National Health Mission in 2005, at an all-India level, 47 per cent of the sanctioned posts were vacant even when the requirement was far below population norms,” said Avani Kapur, a fellow at the Centre for Policy Research. Doctors blame a lack of infrastructure for them and their families in rural areas for the lukewarm response to the posts. The Rural Health Statistics report appears to back this to an extent. According to the report, 10 per cent of the country’s PHCs and CHCs lack toilets. The situation is even worse for sub-centres. The data reveals that of the 1.56 lakh sub-centres across India, almost 30,000 of them did not have toilet facility for staff whereas more than 43,000 centres were running with a common toilet for both male and female patients. Doctors also cite low pay for the indifference. K.K. Aggarwal, former president of Indian Medical Association, said there is a dearth of specialists across the country as only 50 per cent of MBBS students go for specialisations. Doctors, govt employees in various departments, teachers at various levels, info commissioners — all sorts of Posts are lying vacant all across India. If all of them were to get filled, will the government have enough funds to pay them? Is that the anxiety for not filling up vacancies, or the government is waiting to evolve a foolproof Hindutva testing regime to make sure that only the “right” kind of guys get hired?